As Mr. Obama met with his national security advisers for three hours to discuss Pakistan today, there was mounting opposition in Pakistan to the terms of the just approved Kerry-Lugar Bill offering $1.5 billion a year in US aid for the next five years. The US media reports suggest that the opposition is coming mainly from the powerful Pakistani military. However, it appears from a recent Gallup poll that there is growing distrust of the United States among ordinary Pakistanis as well. What seems to be adding fuel to the fire are the language and the conditions in the US aid bill that hold Pakistan implicitly responsible for all acts of terror in its neighborhood. Specifically, the bill, also known as the Enhanced Partnership with Pakistan Act, says as follows: "... ceasing support, including by any elements within the Pakistan military or its intelligence agency, to extremist and terrorist groups, particularly to any group that has conducted attacks against the United States or coalition forces in Afghanistan, or against the territory or people of neighboring countries; (B) preventing al-Qaeda, the Taliban and associated terrorist groups, such as Lashkar-e-Taiba and Jaish-e-Mohammed, from operating in the territory of Pakistan, including carrying out cross-border attacks into neighbouring countries, closing terrorist camps in the Fata, dismantling terrorist bases of operations in other parts of the country, including Quetta and Muridke, and taking action when provided with intelligence about high-level terrorist targets." It is widely believed that, by accepting this aid package, Pakistani government is endorsing the bill's offensive language and accepting the terrorism allegations and humiliating conditions, while paving the way for a much larger US footprint in Pakistan that will undermine its sovereignty. 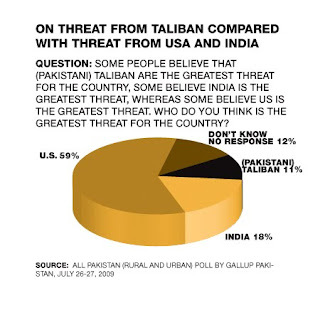 The Gallup poll exclusively done for Aljazeera TV and released in August shows that 59% of Pakistanis believe that the US is the biggest threat to Pakistan, followed by India(18%) and Taliban (11%) as much lesser threats. Fully 67% of the people oppose the US drone attacks against Taliban and al Qaeda in Pakistan. The fear of the growing US presence in the region does not mean that people support the Taliban, as 41% of them favor the Pakistani military operation against the Taliban while 24% oppose it. Support for the military against the Taliban is the strongest among Sindhis at 64%, followed by 50% among Urdu-speaking Mohajirs and 49% among Pushtoons. Only 28% of Punjabis support the military operation but a smaller 25% oppose it. The people of the most populous province of Punjab appear to be the most divided on this issue, which is also in line with only 31% support for military operation among those identifying with Nawaz Sharif's Pakistan Muslim League. In addition to the bad economy impacting many people, the fact that President Asif Ali Zardari is seen as caving in to the US demands is hurting his popularity. Only 11% approve of him while a whopping 42% think he is doing a bad job. 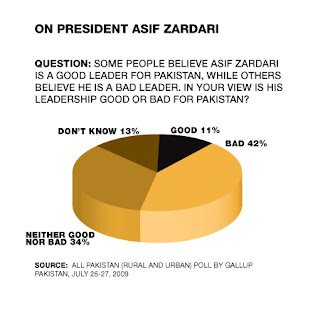 The Gallup results are also confirmed by a more recent IRI survey results in Pakistan. The survey released in early October by the International Republican Institute, a non-profit group promoting democracy whose board is headed by Senator John McCain, found that Pakistanis remained sharply critical of US military efforts. Eighty percent of Pakistanis disagreed with cooperation with the United States on the "war on terror," a figure that shot up 19 points since March, the survey said. At the same time, 86 percent agreed that Taliban and Al-Qaeda militants posed a problem for Pakistan and more than two-thirds supported a recent Pakistani army offensive on extremists. In one of the sharpest swings, the polls showed that Pakistanis were growing increasingly pessimistic about their own economic futures. Some 58 percent of Pakistanis expected their economic situations to worsen in the coming year, up from 36 percent in March, it said. It appears that the whole process by which the US aid package has been handled by the US and Pakistani governments is proving to be counterproductive, jeopardizing the chances of peace and stability in the region. Not only has it angered both the military and the public in Pakistan, it has the potential of seriously hurting political stability in Pakistan, further diminishing the chances of economic recovery in the near future, and it is reducing the probability of success against the perpetrators of terror. In sensitive relationships like the one between US and Pakistan, there should have been a lot more quite diplomacy and much less public display of the US pressure and growing presence in Pakistan. Rather than further inflame the already explosive situation by unnecessary rhetoric, it is time for both governments to try and salvage the relationship, and their common fight against the terrorists, by engaging in serious damage control on both sides. Understandably the Pak Military is upset with the Obama Plan that is looking to cut down on the strong role the military plays in Pakistan Politics and affairs. In fact the Military is like a shadow government behind the real Government. Even though Obama Plan is right about curbing the role of the Military its motives and timing are misplaced. Given the condition Pakistan is in and the corruption of the Politicians that is so rampant without a strong Military Pakistan will not survive. Zardari's singular focus on getting US aid regardless of conditions is backfiring. At the moment, the military is far more aligned with the public opinion, as expressed in two recent polls by Gallup and IRI. Given the choice between trusting the military and trusting Zardari, I think most people choose to trust the military. Many Pakistanis genuinely fear that Zardari will not hesitate in selling out the nation for his own benefit. as an indian my question is that why is Pakistan in such a deep financial mess that it has to depend on aid from US to save itself from bankruptcy. If no need of aid, no need to take dictations from USA. Each and every aid from USA comes with strings attached. I think military would be first Pakistani institution to have read and discussed the K-L bill. None of the parliamentarians would have read and understood what is in there, least of all Yousuf Raza Gilani. The ones in the government would be supporting it because their leaders are doing so while the opposition ones ridiculing it because they want to damage the standing of the govt to gain cheap popularity. Another clear example of the hazards of our democratic dispensation to the country. All emotions aside, the stated goals of the EPPA 962ES are pretty darn good (section 5). It is also a fact that in the past, Pakistani military officials, politicians and bureaucrats have all stolen aid funds, and a donor's oversight on allocations is called for. On that basis, I can support this act. Hopefully it will fix things for the long run as well. As to your comments regarding accepting responsibilities, isn't it a fact that Mumbai attackers were all Pakistani punjabis? Or that ISI is fully supporting Jaish and Lashkar? The issues that the army is up against is section 6 of the EP Act that gives Hillary an open hand into investigation of what Pakistani military is doing. But that is irrelevant to the aid under the EPPA because sec 6 does not affect the $1.5B available under it. Pakistan will not get the aid packages under acts listed therein regardless of whether Pakistan gets EPPA aid or not. I personally know Haqqani (Pakistan's ambassador to the US, he was my brother's class fellow at National College in Karachi). Even if nobody else read the bill, he did, and he is supporting it. I am sure Zardari is a very smart man. He probably suggested some of the terms of the EPPA. He can always take the first year's $1.5B and then hand Hillary his d---, thus dumping the next years' aid. corrupt leaders like zardari are looking to hedge in case things go wrong and army needs to intervene by weakening army. it is really a treasonous behavior. I think he is trying his luck and getting bad advice from his cronies. With current patronage based political system and yes men cabinet, head of majority party is no different than a dictator. Foreign aid is never offered as charity. There is always a quid pro quo. The Americans know it, as do Pakistanis. The polls clearly show that most Pakistanis want the Pak military to fight the Taliban. This Kerry-Lugar bill language and rhetoric distracts from that focus on the war against the Talibs and brings the US in focus as hostile to Pakistan, as perceived by the people and military there. But the way this aid package been handled is going to to get in the way of achieving major US and Pakistani objectives in the region....fighting the common enemy of both, the Taliban and al Qaeda. But can pakistan live wit the taliban ? Fun is pakistan complains that india fiddles around its territory with fake taliaban attacks. New Delhi: Even though the July 2008 blast on the Indian embassy in Kabul claimed five times the number of victims in the latest blast, no organisation had come out to take responsibility . The US and India had both unearthed enough evidence then to suggest the attack was carried out by the Jalaluddin Haqqani faction of Taliban at the behest of ISI. Haqqanis son Sirajuddin was accused of that attack. According to strategic affairs analyst Brahma Chellaney , the attack was carried out by the same forces who executed last years blast and it seemed to be a manifestation of the disquiet in the Pakistani establishment over US President Barack Obamas latest thrust in the war on terror . It is quite deliberate the way they have claimed responsibility . The timing of the latest attack is very important and it suggests that this too has been executed by the perpetrators of last years attacks including the ISI. It comes at a time when President Obama has initiated his two-prong policy in the regionwar in Afghanistan and aid surge in Pakistan, said Chellaney. The New York Times reported on Thursday about the restlessness in the Pakistan military establishment over the manner in which the recent American legislation on aid to Pakistan impinged on Pakistans sovereignty. This includes asking Pakistan to take action against terror groups. Jus days before the US President Barack Hussain Obama will be signing the Kerry-Lugar bill thus turning it into law, Pakistan's political parties have woken up to the problems that it may pose -- a late awakening to say the least. For the past one year, the controversial contents of the Kerry-Lugar bill have been widely known. Equally, in the recent months, it was clear that the House and Senate were not quite biting into Pakistani criticism of the bill. Throughout this period, the government seems to have made no transparent attempt to force a change in the text of the bill. The issues that the text of the bill raised and ones that were to negatively affect the Pakistan-US bilateral relationship were neither discussed in any cabinet meeting, defence committee of the cabinet nor in the parliament. Even the opposition, other than making rhetorical statements regarding the bill never brought up the issue properly. Government attempts were made at an individual level � for example, Pakistan's Ambassador to Washington, Hussain Haqqani -- to lobby for change in the bill. However, such attempts did not really help. The government argues that the removal of the words 'India' and 'A Q Khan', through Pakistan's lobbying, from the text must be appreciated. Other relative 'pluses' in the bill , government representatives argue, include the bringing down of the level of certification, on the conditionalities clause, from the president to secretary of state. From Pakistan's perspective, this is an inconsequential change as long as the certification clauses remain. Also we are told that the waiver clause means that the US President can waive conditions. Yes, but those conditions will be waived in US's national interest, and not when Pakistan needs it, as was done in the case of the Pressler Amendment. On the removal of the demand that the US government has "direct access" to A Q Khan, the fact is that it has been replaced by a wider net of "direct access to Pakistani national associated with such networks." Significantly, the bill goes beyond supplier networks and factors in involved in "networks relating to acquisition of nuclear weapons related materials." This could include those working to acquire nuclear technology for Pakistan's own nuclear programme. Similarly, the conditionality on combating terrorism goes into intrusive details of what Pakistan is required to do. Pakistan's battle against terrorism cannot be designed according to Washington, New Delhi and Kabul's threat perception. The bill essentially declares Pakistan the hub of terrorism that has hit the entire region and puts the onus of fighting terrorism on Pakistan. The strategic plan mentioned in the bill highlights Pakistan as the hub of terrorism in the region by stating that US President Obama will, along with Delhi and Kabul, side with Islamabad on its counter-terrorism policy. Clearly instead of dealing with the problem and the causes simultaneously to make headway in regional cooperation and fighting terrorism, the bill essentially pampers the Indian position on terrorism. Such a bill encourages India to continue with its rejectionist approach to bilateral dialogue. As for democracy, if the bill had stated aid cut-off in case of a coup, it would have been an acceptable clause but to assign to Washington the role of monitoring if the Pakistan army is interfering in the country's judicial and democratic process is unacceptable. The issue is genuine but the mandate illegitimate. In an interview on NPR Radio's Talk of the Nation today, President Musharraf said he sides with the Pakistani military in its anger over the conditions that could be attached to a U.S. aid bill that would triple the amount of development funding to $1.5 billion a year. Pakistani military officials have complained that the bill, co-authored by Sens. John Kerry and Richard Lugar, contains "humiliating" conditions. The bill stipulates, for instance, that the money could dry up if Pakistan fails to fight militants, including Taliban and al-Qaida fighters in the tribal regions along the Afghan border. The measure would also require Pakistan to provide information about networks that have supplied nuclear technology to other nations. That is a reference to Pakistan's nuclear scientist A.Q. Khan, who was accused of selling his country's nuclear technology to countries such as Libya, Iran and North Korea. Musharraf complained repeatedly that although Pakistan has been touted as America's most important ally in the fight against terrorist groups, "this most important ally is being treated with suspicion. We must be treated with trust and cooperation." People are judged by the action and not by their intention. Actions of pakistan might not be paltable for usa and israel who is concerned about the proliferation in middle east. It is an open secret that isreal has enough influence over the usa administration. Interesting analysis of this trend of pakistan seeing usa as a bigger threat than india. It is a legislation passed by the US congress and it took one and half years or more. The text of the legislation was available online for more than a year and was revised continuously. Paksitan has 2 choices. 1) Accept it and confess to the whole world of Pakistan's mischief'. 2) Reject it and Push the economy into a financial dark hole. Pakistan has in the past supplied nuke knowhow to other countries,supported terror against its neighbours,there is no civilian supremacy in Pakistan. All the bill does is point this out. It asks Pakistanis to root out terror groups. Probably, the thorn in the flesh is the mention of Lashkar-i-Toiba. As we all know LeT is a ISI stooge. As a result the army is miffed at being asked to discontinue this unholy relationship. Pakistan is not in any position to pick and choose. Pakistan considers Saudi Arabia and China to be friends but sadly these so-called friends are not as generous as the "evil" USA. China has forex reserve of $2 Trillion. Cant it spare some change to its best friend??? Come ooon! Look at India, even though we have a forex reserve only half as that of China, we have given Afghanistan,our friend, 1.5 Billion dollars. We have helped them build dams,roads,hospitals,schools,etc. We have even provided them with Buses to help with public transport in Afghanistan. Too bad Paksitan cannot tell which of its friends to trust and which not to.. I would advice the Pakistani govt to go and beg the Chinese and ask the "brotherly" Saudis to lend some money..
Look at Saudi Arabia to whom Pakistanis profess undying love and affection. It has given peanuts when it comes to aid. With such large oil reserves and forex reserves you expected a Muslims country to help out a fellow muslim country. But, the truth is there is no concept called the Muslim "ummah". Pakistan demonstrated this when it went on a rampage against Muslim Bangladeshis in 1970-71. Pak army looted,raped and murdered Bangladeshis who are Muslims. Saudis have just reinforced the fact that there is no such thing as the "ummah". The biggest Threat to Pakistan is its Army. It acts like a state inside a state. If military has a role to play in policy making, peace and prosperity for civilians will never be its priority. To move towards long term peace and prosperity, Pakistanis need access to better education. maaran: "The biggest Threat to Pakistan is its Army. It acts like a state inside a state. If military has a role to play in policy making, peace and prosperity for civilians will never be its priority." I totally disagree. Pakistani military is much more representative of the people and much more rooted among the poor and the middle classes than the corrupt feudal politicians of Pakistan. Pakistani Military runs schools, clinics and many industries which serve the people and give the military establishment a stake in the economic well-being of the people. maran: "To move towards long term peace and prosperity, Pakistanis need access to better education." I totally agree. And again, the military is more transparent and much less corrupt in building the educational infrastructure than the civilian politicians or the bureaucracy in Pakistan. If you think that army is transparent why did mush walk away in favour of the so called democratic forces. Why is kayani not overthrowing the democracy to form a dictator ship inspite of all irritation by zardari and his cronies. My friend logistics are in the hands of USA and West. China is a unreliable friend for anybody. Military require the support of the western countries for maintainenace of all these gizmos. of US senator John Kerry, co-author of the legislation which has caused immense heartburn in Pakistan because of its “insulting tone” and “humiliating language” while disbursing a $ 7.5 billion aid. Zain H Qureshi served as an intern in Kerry’s Washington office during an unspecified period when the bill was being readied, according to reports that first surfaced online and was subsequently confirmed by the Senator’s aides. It is not clear if Qureshi jr was in any way associated with the crafting of the bill, being a relatively junior aide, but the very fact that he worked in the office of the senator who produced such a controversial legislation, widely seen in Pakistan as undermining its military, has inflamed pro-military Pakistani circles. Charges of treachery and subversion are flying around online where angry Pakistanis, passing around young Qureshi’s business card listing him as a “Legislative Fellow” in Kerry’s office, are saying the foreign minister’s position has become untenable. “Joe Biden’s son, Beau, recently spent a year in combat in Iraq. Why not send Zain Qureshi to Waziristan?” one cybernaut tweeted angrily. In the aftermath of the KL Bill, the striking fact emerging is that Army is a more popular entity in Pakistan than any political party. Since Army expressed reservations on the bill in the corps commanders conference, all political parties and media started hyping the same theme. However, since Army did not present a totally negative view but only gave some reservations while accepting the US aid medium as a positive one for Pakistan in principle, the criticism has remained very muted and by and large ineffective. The lesson to learn is that when Army is in power, they should not try to bring their rule into political framework or pretend to do so. They should clearly declare themselves as the ruling entity with the prime objectives as a) economic revamp/ uplift of the country to make it sustainable and b) securing the country within its present frontiers by acting against extremist and separatist elements. Rest of the affairs can be under a democratic dispensation thus enabling a practical system that can work unidirectionally in the forward direction. The two objectives are in fact very logical to adopt for the Army for its own selfish interest also, as economic uplift means more funds for its sustenance while continuation of the Pakistani entity assures a place for them in the country's political dispensation. I think Musharraf lost out for the same reason, else there was no serious public reaction against his government, like the PNA one against Bhutto. Regarding your zardari comment. Riaz, in Paksitan what ever may be the case nobody can yield more power than the army.. everybody knows that.. Zardari at one point of time will have to clip his own wings or the army will do it for him.. Speaking to Pakistani newspaper editors in Lahore on Thursday evening, she said she found it hard to believe that nobody in the Pakistani government knew where al-Qaeda was hiding in the country and "couldn't get them" if they wanted. In an interview with the BBC, Mrs Clinton clarified her comments and the US view of the Pakistan government's commitment to combating militancy. "Of course we are very encouraged to see what the government is doing. At the same time, it is just a fact that al-Qaeda had sought refuge in Pakistan after the US and our allies went after them because of the attack on 9/11," she said. The fact is that ISI has caught many time more real al Qaeda terrorists and leaders, and more Pakistani soldiers and civilians have died in the real war on terror than soldiers and civilians from all of the other nations combined and Pakistan and Pakistanis have been the biggest victims of terror in this century. Yet, it is surprising to hear Hilary Clinton complaining about Pakistan's role in hunting al Qaeda. The recent US foreign aid bill for Pakistan is a good example. Pro-India groups lobbied hard for all sorts of conditions to be inserted into the bill. Sanjay Puri was part of this campaign. This was not about supporting India's interests, he insists, and neither was it motivated by hostility towards Pakistan. "Our activities are not aimed against the people of Pakistan or against the State of Pakistan," he told me. "It is about accountability and transparency. We are very active in making sure that when US taxpayers' money is being spent, especially in these difficult economic times, there has to be a level of transparency." The Indian-American community, he told me, "is supportive of aid that relates to democracy in Pakistan, education, reforms progress on women's rights and so on". "But if Pakistan says that it needs F16 jets to hunt down terrorists," he adds, "I don't think the average American is going to buy that." For a referee in this struggle, I turned to Professor Walter Andersen, director of the South Asia programme at the School of Advanced International Studies at Johns Hopkins University. A former diplomat, he has watched the development of these US-based lobbying groups with great interest. The galvanising event he told me, was the struggle over the US-India nuclear deal which came to a head in 2008. The US wanted to help India with civil nuclear technology but was prevented from doing so by legislation banning the export of fuel or know-how to any country that had not signed the Nuclear Non-Proliferation Treaty. So the Bush administration sought to make an exception for India. "The Bush team very smartly contacted the India lobby," Professor Andersen told me, "and worked very closely with it." The US Chamber of Commerce and its India section also got involved because of the prospect of business. "So you had American business interests, the administration and the Indian-American lobby all very actively pushing for this. There was a lot of opposition. In some ways it went down to the wire," he noted, "but their persistent effort paid off." It was hardly a fight I had expected. Less than a year earlier, the State Department had invited me to speak in Washington, D.C., and introduced me as a "moderate" Muslim intellectual who denounced terrorism and attacks against civilians. Now it was banning me from U.S. soil under a provision of the Patriot Act that allows for "ideological exclusions." My offense, it seemed, had been to forcefully criticize America's support for Israel and the wars in Iraq and Afghanistan. The U.S. accused me of endorsing terrorism through my words and funding it through donations to a Swiss charity with alleged ties to Gaza. Civil-liberties groups challenged my case in court for almost six years until, in late January, Secretary of State Hillary Clinton dropped the allegations against me, effectively ending my ban. In early April I will make my first public appearance in the U.S., at New York City's Cooper Union, participating in a panel discussion about Muslims. While it's a victory of sorts, the fight is not over. Numerous foreign scholars remain banned from U.S. soil. Until the section of the Patriot Act that kept me out of the country is lifted, more people will suffer the same fate. Although the exclusions are carried out in the name of security and stability, they actually threaten both by closing off the open, critical, and constructive dialogue that once defined this country. In my case, criticizing America's Middle East policies cast doubt on my loyalty to Western values and cost me a job. But prejudice may ultimately cost the U.S. more. By creating divisions and disregarding its values, even in the name of security, America tells the world that it is frightened and unstable—above all, vulnerable. In the long term, it also reinforces the religious, cultural, and social isolation of minority groups, encouraging the very kind of disloyalty that these ideological exclusions are meant to prevent. It's not the first time America has tried to shield itself from dissenting opinions. During the Cold War, dozens of overseas artists, activists, and intellectuals—including British novelist Doris Lessing, Chilean poet Pablo Neruda, and Colombian author Gabriel García Márquez—were denied visas because of their left-leaning ideas. Today, though, the American concept of the "other" has taken on a relatively new and specific form: the Muslim. America must face the reality that, in the West, many adherents to Islam demonstrate loyalty to democratic values through criticism. While violence must always be condemned, such debate must be encouraged if those values are to last. Those who contend that foreign aid does not work - and cannot work - are mistaken. These skeptics make a career of promoting pessimism by pointing to the many undoubted failures of past aid efforts. But the fact remains that we can help ensure the successful economic development of the poorest countries. We can help them escape from poverty. It's in our national interest to do so. The first step out of rural poverty almost always involves a boost in food production to end cycles of famine. Asia's ascent from poverty in the last 40 years began with a "green revolution." Food yields doubled or tripled. The Rockefeller Foundation helped with the development and propagation of high-yield seeds, and US aid enabled India and other countries to provide subsidized fertilizer and seeds to impoverished farmers. Once farmers could earn an income, they could move on to small-business development. A second step out of poverty is an improvement in health conditions, led by improved nutrition, cleaner drinking water, and more basic health services. In the Asian success stories, child mortality dropped sharply, which, in turn, led to smaller families because poor parents gained confidence that their children would survive to adulthood. The third step is the move from economic isolation to international trade. Chile, for instance, has become the chief source of off-season fruit in the US during the past 20 years by creating highly efficient supply chains. China and India have boomed as exporters of manufacturing goods and services, respectively. In all three, trade linkages were a matter of improved connectivity - roads, power, telecommunications, the Internet, and transport containerization. Today, the skeptics like to claim that Africa is too far behind, too corrupt, to become a China or India. They are mistaken. An African green revolution, health revolution, and connectivity revolution are all within reach. Engineers and scientists have already developed the needed tools. The Millennium Villages project, which I and a group of colleagues developed, is now rapidly expanding in 10 countries in Africa and is showing that this triple transformation - in improved agriculture, health, and connectivity - is feasible. Improved seed varieties, fertilizers, irrigation, and trucks have all helped convert famine into bumper crops in just one or two productive growing seasons. Malaria is under control. Farmers have access to capital to make the change from subsistence to cash crops. Children are being treated for worms and receive a midday meal to help keep them healthy and in school. The ISI is hated by Pakistan's enemies mainly because it is the best at what it does in terms of protecting Pakistan interests. Some in the CIA, RAW and Mossad show a natural professional jealousy and envy of the ISI....and they try and slander it as often as they can through their friendly media and its blind followers. Here's a website "smashinglits.com" that ranks as ISI #1 intelligence agency in the world...followed by MOSSAD, MI6, CIA, MSS, BND, FSB, DGSE, RAW and ASIS. "Perhaps more than for any other country, the US grand strategy is about war, and the interaction between war and economic life. The United States is historically a warlike country. The nation has been directly or indirectly at war for most of of its existence...the war of 1812, the Mexican-American War, the Civil War, the Spanish-American War, World Wars I and II, the Korean War, Vietnam War and Desert Storm. And the US has been constantly at war in Afghanistan and Iraq since the beginning of this century." "The United States has achieved its strategic objective of further dividing and destabilizing the Islamic world after 911. The US-induced chaos and deep divisions in the Islamic world are sufficient to fend off any challenges to the US power from any of the large Muslims nations of Indonesia, Pakistan, Iran or Egypt during this century. Even if America loses in Afghanistan, it has already scored a strategic win against the deeply divided Islamic world."